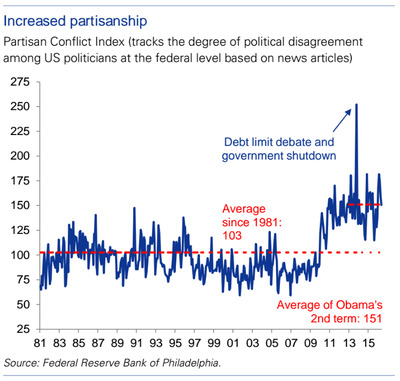 Polarization among US politicians has surged over the last decade. 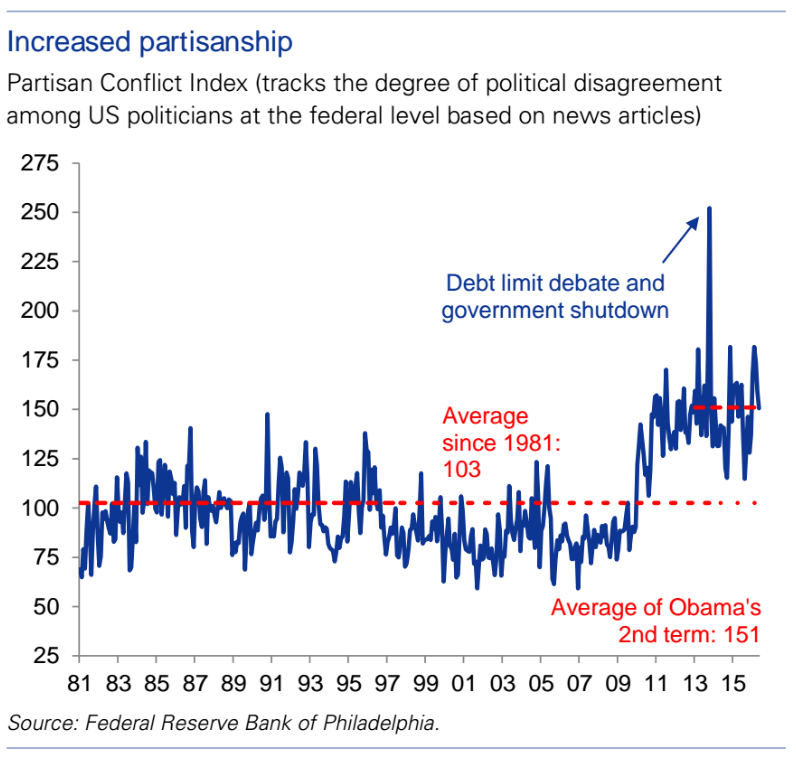 , which tracks the degree of political disagreement among US politicians at the federal level based on news articles, to show just how dramatic this spike has been. Over the course of President Barack Obama’s second term in office, the index has averaged 151. By comparison, the index averaged 103 from 1981 to today. Even more stunning is the jump during the October 2013 debt limit debate/government shutdown when it rose to over 250. Moreover, a recent Pew Research survey found that both Republicans and Democrats now have more negative views of the other party than at any point in about 25 years. The survey found that folks supporting both parties were likely to associate negative characteristics with members of the opposite party, and positive traits with their own. 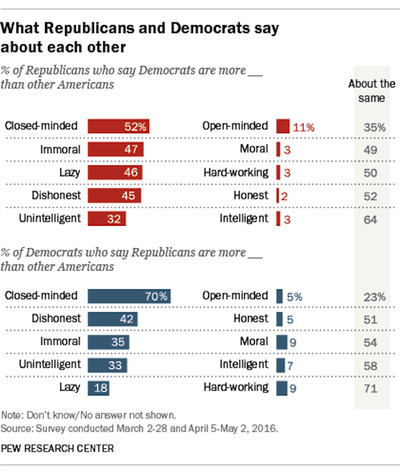 As a kind of interesting-but-not-unexpected detail about human nature, people who had friends in the opposite party were less likely to have “very cold” feelings about that party in general, according to Pew. But the drama’s not just between Republicans and Democrats. Polarization has increased within parties, too. division within a major party, it’s stil worth noting that this is happening. The Goldman Sachs report also included a chart using data from Pew showing that Trump is a more divisive candidate than several other recent Republican presumptive nominees. 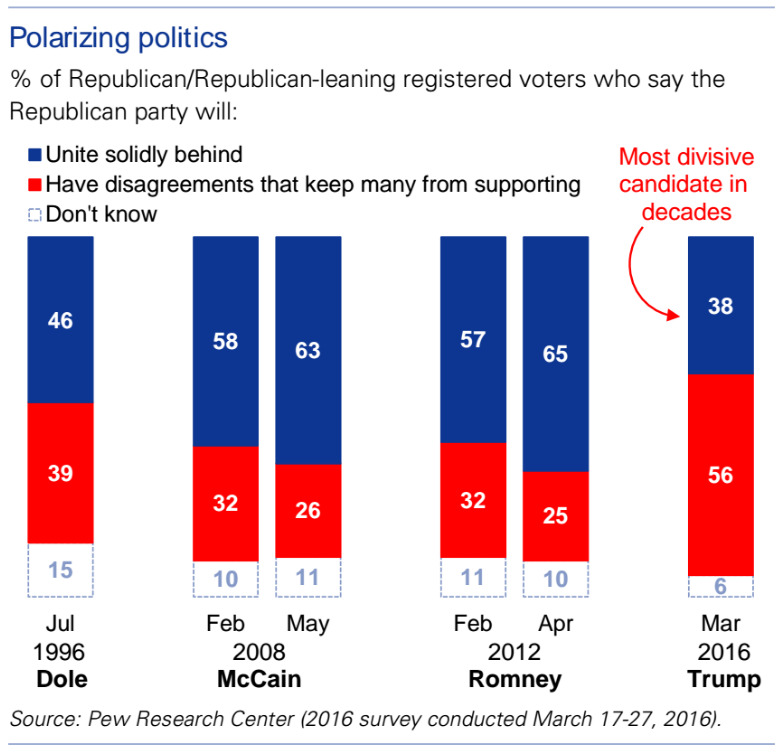 By comparison, 63% of respondents in a May 2008 survey said the party will “unite solidly behind” John McCain, and 65% of respondents in an April 2012 survey said the party will do so regarding Mitt Romney.